I thought I'd share this amazing drawing of me by the incredibly talented Harriet Gray drew of me. As soon as she emailled me over the initial drawing, I knew I 100% had to go ahead and buy the print for my Mum. She'd been banging on about wanting a drawing of me for the house for years so I thought this would be absolutely perfect. I can confirm she loved it, and now I've seen the print in person, it looks incredible in real life! This drawing is based on this outfit I wore here from a few months ago in a ASOS dipped back dress and a Primark armour style necklace. Harriet didn't ask me to post this but I knew I wanted to share it on here, as I simply can't put into words how much I love it! She's a freelance illustrator who graduated from Bournemouth Arts Institute back in 2008. She told me she works mainly in pencil with the occasional use of watercolour and crayon. I especially loved the softness of the colours, the detail in the hair and the eyes and then the pop of colour that she used for the cross print. Harriet also takes commercial and personal commissions, including headers for blogs. You can also find her work on Etsy or check out her other work on her blog here. I have to say a big massive thank you to her for drawing me! Would it be too narcissistic of me to get another copy for my room at home? I absolutely LOVE this post! Completely and utterly want one for myself now.... Off to hop skip over to her blog!! I saw this somewhere before..possibly on Harriet's blog and it is so wonderful!! She's captured your likeness perfectly and I love her style. She also draw Esthée, didn't she? She is so talented, it's incredible! That really is an amazing drawing she captured all the little details and ur love of crosses. Whoa. That takes a lot of talent! Amazing! she is really talented, it looks just like you. Wow. That is amazing. What I would give to be able to draw like that! That's so so good! What a talented lady! This is amazing, she's so talented! oh wow, this is amazing. loving all of her work that's popping up on all the blogs at the moment, they're amazing! That's incredible, she's amazingly talented! This is absolutely amazing! I'm definitely getting myself one of these haha! You're beaut! I'm new to this, so give me a check! SO amazing! Looks just like you! If I could choose a talent, it would most certainly be drawing! Wonderful! Lovely blog sweetie, always read. wow amazing, this must have taken her ages! portraits are always so hard to get right but it looks just like you! Wowzers, what a talent! 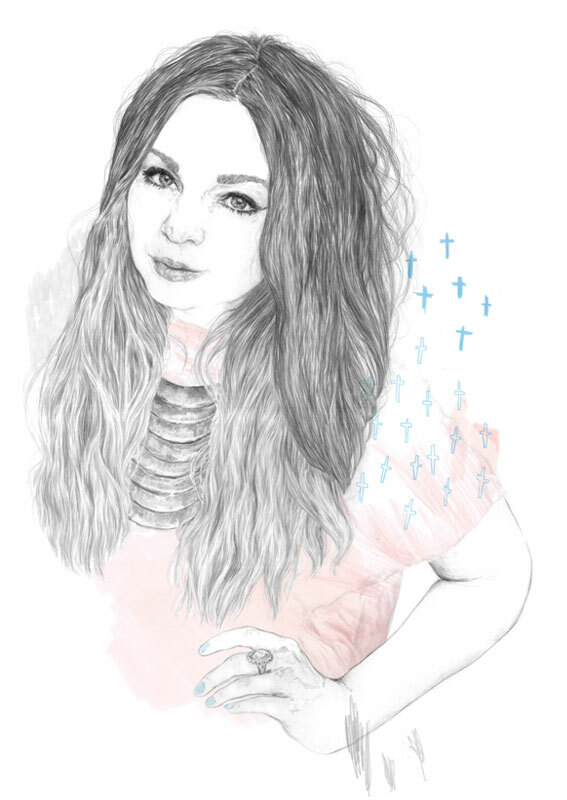 Thanks for sharing her beautiful illustration of you with us and introducing us to her work!